A massive die-off of Cassin’s auklets, murres and other birds in 2014 and 2015 has been linked to the marine heat wave known as The Blob. The tip-off that something had gone seriously wrong for a small gray sea bird called the Cassin’s auklet were the carcasses washing up on beaches by the thousands. That massive die-off of sea birds was caused by a marine heat wave known as The Blob, so named because of the shape of the enormous lens of unusually warm water parked off the West Coast. New research published in the scientific journal Geophysical Research Letters has determined it was The Blob that killed the auklets, which starved to death. Carcass counts in Oregon and Washington began to increase in October 2014. By mid-December, thousands of carcasses were deposited over a short period of time throughout the region. 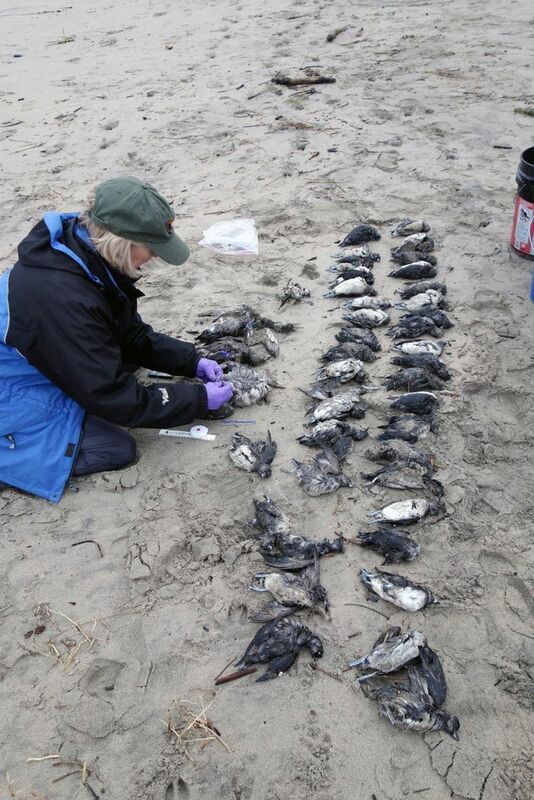 By April 2015, more than 9,100 carcasses were recorded by citizen-science beach observers across 253 miles of surveyed beaches with the counts in Oregon and Washington accounting for 86 percent of the total. The birds were found all along the coast from California to British Columbia. The Blob started cooking the coastal waters in 2013 and persisted in 2014. It kept right on growing, creating by 2015 a mass of warm water about the size of Canada along the west coast of North America, with sea surface temperatures 3.5 degrees Celsius above the 1981-2010 norm. What scientists are learning is that the physical anomaly created biological effects just as large. Tough birds. The size of a robin, Cassin’s auklets are gray flying footballs, known for hurling themselves into vegetation as they come ashore rather than the delicate landings of song birds. Wintering on the open ocean and digging their nesting burrows with their beak and feet, these are scrappy animals, able to fly not only through the air but underwater, Parrish said. She observed them in their largest known colony, an archipelago at the northwest tip of Vancouver Island, where they kept her awake most nights, barreling into the sides of her tent as they crash-landed for roosting. But The Blob was too much even for them. Pushed in 2014 and 2015 to a narrow band of cool water still remaining along Washington’s coast as they dispersed from their breeding habitat in British Columbia, the auklets were crowded together, in tough competition for food. As the warm water pushed into their last stronghold, they had nowhere left to go. A diving bird that pursues its prey, auklets need a lot of energy in every mouthful but instead had only the junk food of smaller, less-nutritious food in the warm water. They starved to death by the thousands, researchers determined, washing up dead on beaches from California to British Columbia. As The Blob moved north, murres were the next to go, in Alaska in 2016, with 27,000 carcasses recorded. And on it went, up the coast all the way to the Arctic, with millions of seabirds dead by the time the warm-water mass dispersed, Parrish said. The carcasses were documented in beach surveys completed by participants in three citizen-science programs, COASST, Beach Watch and BeachCOMBERS, which revealed the surge, comparing the numbers with prior years. The study demonstrated the importance of long-term data sets gathered over large areas by trained citizen volunteers. It also showed yet another implication of the ecological effects of climate change. “With such large-scale changes in the ocean we had very dramatic responses. We had a window into a future of a warmer ocean,” Parrish said. “We are getting a sense of who the winners and losers might be in a warmer world.” Cassin’s auklets may need to move north to survive. Other effects of The Blob are also still being seen in declining spring-chinook populations. The counts of adult returns of spring chinook at Bonneville Dam to the Columbia and Snake rivers so far this year as well as of immature adults called jacks are depressed well below 10-year averages. That was predicted by scientists who last year saw the lowest number of out-migrating juvenile chinook from the Columbia in decades in an annual ocean survey along the outer coast of Washington and Oregon. The researchers predicted then that would mean lower numbers of returning adults. “It’s a symptom of a larger set of dynamics,” said Brian Burke, fish biologist at NOAA’s Northwest Fisheries Science Center in Seattle, who led the trawl survey last year and will lead it again this year.